Chloraka Village, Paphos, Cyprus - This lovely 2 bedroom, ground floor apartment is located on the award winning development of St Nicolas in Chloraka. 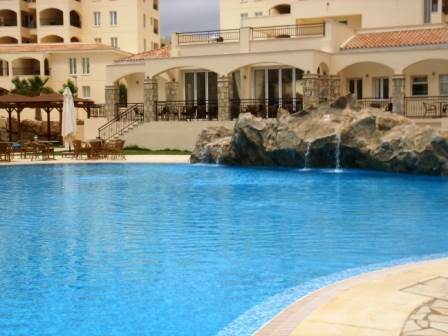 Fabulous beaches are close by as it is half way between Coral Bay and Kato Paphos. Paphos town is also only a 5 minute drive away where you will find all of the shops, boutiques and old market. The local and popular village of Chlorakas is within easy walking distance with its shops, banks, local tavernas and coffee shops. The community has several outdoor swimming pools, a children’s pool and play area, tennis court, restaurant and bar, on-site shop, gym, jacuzzi, and sauna. The apartment is a corner property so there are two points of access, one via the central lobby to the front door, and the second directly accessing the kitchen from the side entrance. A security access system from the main entrance to the building is in operation, and the electricity for the apartment is operated by a key card system. The apartment comprises a light and airy open plan lounge, dining area and well equipped kitchen. Patio doors lead from the lounge onto a large veranda with patio furniture. The bedroom accommodation is nicely separated from the living areas, having two double sized bedrooms with plenty of storage. The master bedroom has an en-suite shower room and there is a good size separate bathroom. Furnishings are modern, tasteful and included in the price. This is an excellent property to be used for vacations or as a rental investment. No other community has as many amenities! Must be seen!